Itâ€™s been a long time coming but we are finally getting sanders that don't create a dust hazard or make your hands go numb. This machine directly borrows from the GEX 125-150 AVE random orbital sander in two major ways; one, a decoupled upper body to reduce the vibration felt in the hand and arm which can be a serious problem with continuous working. Two, the dust box at the back not only holds dust by filtering as it is fed through the box, the dust is effectively removed at source so little dust is left in the air. As invisible dust particles can penetrate skin tissue and cause lung damage this is really very important. The lower body is a substantial aluminium casting which in itself would help to isolate movement from the upper tough plastic motor casing. The thick metal sanding platen has clips to take standard papers, in the production version it would be supplied with a hole punch to match the extraction holes. Heavily sprung red levers lift the clips for fitting the abrasive. Underneath a thick foam sheet has hook-and-loop fastening for precut abrasive sheets which I would suggest are the best type for quickness and extraction efficiency. The platen can be swapped for one with a delta shaped nose. When you twist the upper body it moves independently of the base because of the vibration decoupling mechanism. The upper body has a grippy rubber overmould which dampens vibration and there is the standard sprung switch trigger and a variable speed thumbwheel on one side. The cylindrical dustbox is a bit stiff to get on or off but ensures a good seal. You could use an extraction hose but experience shows this type of collector works really well. Twist the ventilated end cap to remove it and a finned paper filter is exposed. Dust can then be tipped out, wearing a mask of course. 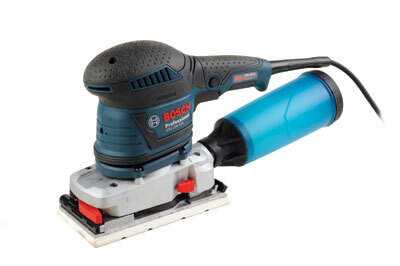 We tried this sander on a stained teak panel - an unpleasant timber to sand because of side effects from the dust. However, the GSS 230 AVE did not produce any visible dust and the atmosphere was clear. Hopefully the more dangerous invisible dust particles were also being caught. Obviously it is still sensible to wear PPE but this level of extraction is the way forward. Vibration-wise it was good, though hard to prove without scientific testing, but comfortable to use. The noise level was low but not exceptionally so. 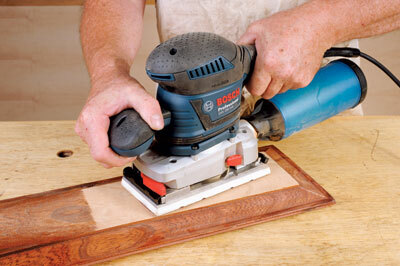 An efficient and healthy way to sand in a trade rated product.